The importance of dentists being alert to the possibility of cracked teeth and what problems can occur if the condition is misdiagnosed or mistreated. Cracked tooth syndrome is a common occurrence in general dental practice and can be difficult to diagnose. Unfortunately, there are some dentists who are not carrying out appropriate diagnosis and management and are causing patients unnecessary pain and suffering. Cracked tooth syndrome (CTS) is common. 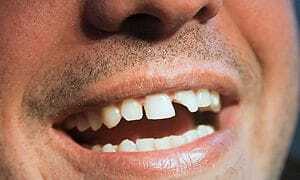 It is estimated that, out of a group of 23 adults, one back tooth will fracture each year . CTS can be defined as the incomplete fracture of a tooth and is sometimes known as split tooth syndrome or green stick fracture. CTS can be caused by excessive biting forces, for example, from chewing very hard foodstuffs or from accidents or sports trauma. In some cases habits such as tooth grinding can contribute to CTS. In other cases, having heavily filled teeth or root filled teeth will naturally weaken whatever tooth structure remains and predispose the tooth to CTS. CTS can initially be very painful with patients suffering a short sharp pain on biting. In the long term, bacteria can breed along the crack which can lead to inflammation of the pulp (nerve) and then cause pulp death and lead to a tooth abscess. It is therefore essential that dentists correctly diagnose CTS and rule out other potential causes of the symptoms experienced by patients to prevent misdiagnosis and sometimes unnecessary treatment. Diagnosis is based on careful investigation of the presenting history and various clinical tests. Radiographs are usually unhelpful as cracks are not visible on radiographs. As cracks are also difficult to see with the naked eye, dentists should use a special bite test to try and elicit the same pain described by the patient. Use of judiciously placed cotton wool, saliva ejectors or any other piece of common dental surgery material can be used to perform this bite test. One of the most accurate special tests that dentists can use to diagnose CTS is the specially designed Tooth Slooth device which is effectively just a simple specially shaped plastic biting instrument. If the presenting tooth has a pre-existing restoration, then removal of the restoration to try and locate the crack is usually justified. Sometimes orthodontic bands can be placed around teeth suspected of CTS. The band acts to stabilise the crack and prevent further enlargement of the crack. Once CTS has been carefully diagnosed the next stage is to check whether the pulp of the tooth is compromised and if root canal treatment is required. Careful consideration of the history, vitality tests and radiographs are all required to make this assessment. The final step is to restore the tooth. Whether root canal treatment is needed or not, the cracked tooth is ideally restored with a full coverage crown or onlay. Teeth restored with crowns or onlays show further fracture resistance three times greater than that of an unrestored tooth. • Treating the wrong tooth causing unnecessary damage and reducing long term prognosis. • Unnecessary pain and suffering from failing to detect the crack or not carrying out appropriate management once the diagnosis has been correctly made. Our Dental Negligence Team has successfully concluded many dental negligence cases relating to negligent misdiagnosis of cracked tooth syndrome or negligent management of the problem. This is a problem which should be preventable with competent practice and therefore it seems that further training and awareness is needed in this area to avoid these problems for patients. If you have concerns about your dental treatment please contact the Dental Negligence Team for specialist advice.